Ghost Drivers, Ready to Play-Test. Ghost Drivers is a system for adding drivers to a race that will drive themselves. You could race by your self against a field of Ghost Drivers or add some Ghost Drivers to a field of humans to fill out the field. These Ghost Drivers are basic/generic Ghosts and are set-up to represent a modest challenge for less experienced drivers. Experienced Championship Formula Racing drivers out there should have no trouble beating a field of 5 Ghosts most of the time. But that's OK. We need something for beginners to cut their teeth on. Mostly I want to make sure that the cars work and the strategies make sense. The kind of feedback that would be great is to know if a particular strategy doesn't make sense or a car ends up finishing the race with a lot of wear left over or the instructions on the track don't seem to make sense or there seems like there should be a better move that the Ghost should be trying for in specific situations. In addition to the usual, spelling, grammar, punctuation, or general "I have no idea what Doug is trying to say here." Feel free to include any thoughts in the comments below or contact me directly with feedback. What I'm working on next are Ghost versions of Nurbergring and Monza, basic Ghost Drivers for those two tracks, and historic Ghost drivers for Monaco, Nurbergring, and Monza. Historic drivers will be more challenging. What I've included below are enough print-and-play materials to run a race with any number of humans against up to 5 Ghost Drivers at Monaco. In addition, you can see some of the directions I'm going with other components. Here are all of the files. Other then these, all you will need are 2 dice (6-sided), something to keep track of wear and skill with (I use poker chips), and an understanding of the rules although, this system would probably work fine with most any recent variation of the game. Below are descriptions of what everything is and basic thoughts on how to print them out. First up, some generic materials. The first is a set of speed cards. I print these out on card stock to stiffen them up a little then cut them out. One sheet is enough cards for a single driver. You will need to have one set for every Ghost Driver and Human Driver. You only really need the first page. Page two are backs. Next are attribute cards. This is my initial concept for reusable car set-up. I also print out these two pages onto card stock then cut them out to make a single car set-up deck. You will only need one car set-up deck for each human players. Ghost Drivers do not need set-up decks. For each car attribute (acceleration, deceleration, etc.) there are 4 cards representing the four choices for each attribute. 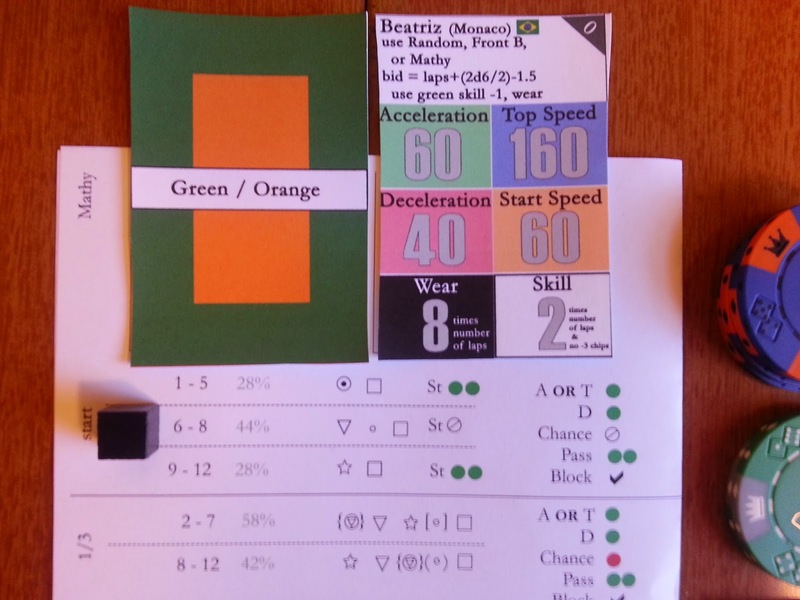 Set-up points are printed in the corner of each card. The idea is that each human can go through the deck picking out one card per attribute until they have a net 2 points. The selected cards can be placed face down in a stack until everyone has set-up there cars. Then the cards are arranged in front of each driver so that everyone can see. Also included on these pages are two -20 markers that can be used to mark damaged acceleration, deceleration, or top speed. Now on to the files that directly relate to Ghost Drivers. First up is the Ghost Rules book that explains how the whole system is supposed to work. I'll try to get a video up soonish as well. Next are the Ghost Strategy cards, The rules explain how these work, but they basically encapsulate generic strategies. The idea is that these cards will be used for all of the different tracks. In production these would be two-sided. After you print these out (on regular paper) fold them in half so that one strategy card is on one side and one is on the other. I know this wastes some paper, but its easier then getting double sided lined up right, especially since this is play-testing. It also means you could use both cards that appear on the same sheet if you really wanted to, but the current design is that you would only use one side or the other. Now this page are the specific Ghost Driver cards. They define the stats and strategy combinations for specific Ghost drivers for Monaco. I print these out on card stock as well before cutting them out since you have to shuffle them a little. Finally, the track itself. This is the same Monaco you know and love but it has markings on it to give the Ghosts some track related guidance. This pdf has two pages, that overlap to form the entire track at a scale that works with the aforementioned plastic cars from Formula De/D or Formula Motor Racing. After printing out both pages, cut the edge of one of them so that it can be placed on top of the other to create one seamless track and then tape in place.